Week 1 of the 2018 college football season is in the books, and by-and-large, the PFF ELO rating system did a good job, as PFF ELO top 25 teams Northwestern, LSU, Notre Dame and Iowa punched higher than their AP poll ranking (or non-ranking), while teams like Texas and Miami, (teams we didn’t rate highly initially) struggled to Week-1 losses. 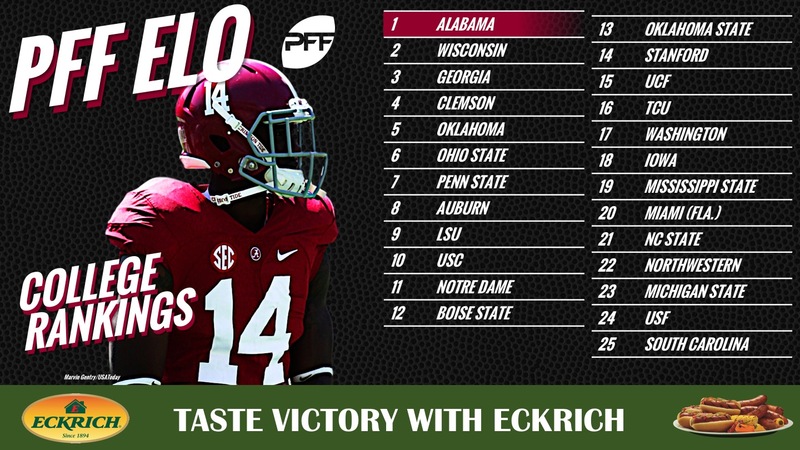 Below is the second installment of our weekly PFF ELO rankings for college football. Like all ELO systems (including our version for the NFL), PFF ELO is an iterative system that updates each team’s rating after each game based on two things: how well they played against their opponent and how well they were expected to play against their opponent. The PFF ELO rating system measures the former using our unique offensive, defensive and special teams grades, while the latter is determined by the PFF ELO ratings leading up to the game and where the game is played. Sometimes in football, the best team does not win, and PFF ELO accounts for these oddities by using our grades. Hence there will be teams rated higher or lower in this system than their win-loss record would suggest. Since PFF began charting college football in 2014, the difference in PFF ELO values alone has been able to explain over three-fourths of the variance in the closing Vegas line. Check back on our site for weekly college spread picks using this model (as well as other information) and check out PFF Greenline for our NFL version of the product. Alabama rolled to a 51-14 victory in Week 1. Head coach Nick Saban appears comfortable utilizing multiple quarterback looks as Tua Tagovailoa handled 34 snaps compared to Jalen Hurts’ 24. Tua looked elite with 22.2 percent of his throws grading as a big-time throw. Our Expected Points model awarded him with 0.73 points added in Week 1, Hurts in comparison added 0.28. Deionte Thompson was elite in the secondary, posting a 94.0 Week 1 grade. He made PFF’s NCAA Team of the Week as the highest-graded player on Alabama’s stellar defense. The Crimson Tide picked up 18 ELO Points from their Week 1 win and are by far the best team in the country in our PFF ELO Model. Team Nos. 2-6 in our model are separated by 15 total ELO points. That is a narrower range than the distance between No. 1 Alabama (1,737) and No. 2 Wisconsin (1,705). At this point in the season, the ranking for teams in this cohort could change significantly from week to week. Wisconsin took care of Western Kentucky at home 34-3. QB Alex Hornibrook was effective on 35 dropbacks, posting an accuracy percentage of 67.9 percent. His percentage of positively-graded throws was 42.9 percent (highest in the Big Ten). The much-talked-about offensive line allowed eight pressures and three sacks, not encouraging for the hype that surrounded this unit. If they can keep Hornibrook clean (114.1 quarterback rating when kept clean), they have the talent to be a very efficient, well-balanced offense. The defense did enough to keep the Hilltoppers out of the end zone. As a defensive unit, they had nine total pressures but the issue is the 13 missed tackles they had. Overall a fairly solid start for the No. 2 ranked Badgers but some points need to be corrected before they get into their games against much tougher opponents. There wasn’t much to glean from Georgia’s 45-0 beating of Austin Peay on Saturday. QB Jake Fromm started, played a total of 26 snaps and didn’t complete a pass over 20 yards in the air. In fact, he registered zero passes we would deem a “big-time throw” or a “turnover-worthy play.” Nonetheless, they were very efficient as a group, generating positive expected points added on more than 58 percent of their passes and 40 percent of their runs. Defensively, Austin Peay was successful on fewer than 40 percent of their passes and their runs, despite the fact that Georgia was able to generate only one quarterback hit and two hurries (with no sacks). A road test against South Carolina, newly in the PFF ELO Top 25, will tell us more about this team’s prospects moving forward. Like the teams above them, Clemson handled a weaker Furman team in Week 1 on Saturday, despite the fact that quarterback Kelly Bryant earned a negative PFF grade and his team earned a negative EPA on his dropbacks. His 10.5 percent rate of turnover-worthy plays was the highest of the weekend for the ACC. Luckily, Clemson as a team was still efficient offensively, generating success on over 70 percent of their rushing plays Week 1. Defensively, Clemson was able to generate six sacks, but weirdly only seven additional pressures after that. Their four missed tackles were a positive sign, but giving up a positive EPA on passing plays to a team like Furman needs to be addressed if they are going to have similar success in the weeks to come. Kyler Murray was wonderful in his initial appearance for the Sooners on Saturday, connecting on five of his six passes over 10 yards in the air, including two touchdowns. Their 178 yards after contact on the ground were also a positive sign. While their nine missed tackles defensively are a bit concerning, the Sooners surrendered zero first-half points by generating 17 total pressures and 34 stops. Their run defense was a bit weak, surrendering positive EPA on average, but every time FAU dropped back to pass, they surrendered a quarter of an expected point, which is a good sign for these team moving forward. Lost in a blowout win against Oregon State was the fact that the Buckeyes surrendered a decent number of explosive plays defensively. Explosive plays are somewhat noisy, so the fact that they surrendered successful plays on fewer than 35 percent of the snaps against them will bode well moving forward, as will the play of Nick Bosa (four pressures and four stops). Offensively, it doesn’t get much better than producing success on more than 60 percent of your run and pass plays, even if it does come against weaker competition. QB Dwayne Haskins produced a positively-graded pass play on over 40 percent of his dropbacks Saturday, along with zero turnover-worthy throws. If he can approximate this moving forward, the Buckeyes will be where they want to be. Penn State survived a wild thriller at home against Appalachian State winning 45-38 in overtime. Trace McSorley had defining moments but Penn State actually lost -0.09 expected points on his dropbacks. 12.2 percent of his throws were big-time throws and he had no throws that should have resulted in a turnover. However, he struggled to connect on deep throws completing only 2-of-7 attempts that traveled 20-plus yards in the air. As a team, the passing game had a successful play on 50 percent of attempts but this offense generated much more expected points running (0.37) than passing (0.05). Shareef Miller had six QB pressures and three run stops and he was the most reliable Penn State defender as the unit struggled to stop Appalachian State when they needed to most. Auburn provided a thrilling win against Washington in the most anticipated matchup from Week 1. The Auburn defense has to get a lot of credit as it wasn’t the best performance from the Auburn offense. Jarrett Stidham took what the tough Huskies defense gave him, attempting only three throws targeted 20-plus yards downfield. Auburn picked up a mere 0.19 expected points on Stidham’s attempts. Rushing the ball was even worse as only 24.24 percent of attempts were deemed successful. Auburn actually saw -0.38 expected points when running. The Auburn defense limited the Huskies offense and kept the game close enough for Auburn to finish at the end. They were extremely tough against the run allowing only 38.46 percent of runs to be deemed successful. LSU makes a quick move into our Top 10 after a 33-17 thrashing of Miami. Our initial PFF ELO rankings were high on LSU as we had them at No. 11 on our initial list. This seems to be higher than most other rating systems but after Week 1 our model appears to be justified in how much it liked LSU. They gained 27 PFF ELO points and are currently the fourth-highest rated SEC team. The win against Miami was a balanced team approach as QB Joe Burrow actually contributed -0.26 expected points added. Not a healthy mark and it shows he is much more of a game manager than an elite level QB right now. 11.1 percent of his passes had a positive grade which is the second-lowest mark in the SEC for Week 1. Nick Brossette did have an effective game running the football and on 22 attempts, he averaged 3.4 yards after contact. After forcing six missed tackles, he was able to find the end zone twice. Rounding out the Top 10 is USC after taking care of UNLV at home 43-21. There may be cause for a little concern with JT Daniels debut as his accuracy percentage of 61.8 percent feels low but with 22.9 percent of total throws traveling 20 or more yards downfield, he was willing to risk it for large yardage gains. He had only one turnover worthy throw and with 28.2 percent of his throws receiving a positive grade, the potential for what he can turn into as the season progresses already shines through. The defense, which is supposed to be the strength of this team, had a few small breakdowns on Saturday. They did record 20 defensive pressures which can help mask a lot of problems for a team as they also had seven pass breakups and allowed a passer rating of just 84.9.